The new timetables started yesterday, but this morning is the first big test of the peak hour changes. As I’ve already noted, while most lines get a tweak, the Caulfield lines get a big shake-up, especially Frankston. As the number of trains running has increased, more have had to bypass the four CBD loop tunnels. Alamein and Blackburn have done so for decades. Sandringham trains switched in 1996. Werribee in 2008. Now it’s the turn of the Frankston express trains, and of course it’s been my line for most of the past fifteen years, and I’m taking a lot of interest. I was looking a bit more at how and why the new Caulfield group timetable works like it does. While I know some don’t like it, it’s interesting to see how it all fits together. It’s easiest to see by looking at the trains in the PM peak, leaving Richmond (eg after they’ve gone through the loop, or run direct from Flinders Street). What’s going on? Well instead of the complete dog’s breakfast of the old timetables, they’re making better use of the track capacity they have. And they’ve standardised the stopping patterns so that particular trains serve particular stations. You can fit a train through the loop about every 3 minutes. They’ve set up a repeating pattern every 9 minutes. The Pakenham express leaves just before the Cranbourne stopper, because they share the same track all the way to Dandenong, so the express skips more stops, and almost (but not quite) catches up to the previous stopper at Dandenong. The Frankston express leaves just before the Frankston stopper, because they share the same track to Caulfield. After that they have a separate track to Moorabbin, so the express can overtake the previous stopper. The Cranbourne/Pakenham lines are mucho overcrowded, so now there’s never more than a 6 minute gap between them. The old timetable had the Frankston trains run together through the loop, resulting in gaps for Cran/Pak of up to 9 minutes, which meant a lot of crowding on some trains. So the theory is the loads are more even (they claim to have researched this and believe it to be true), so the loading at busy city stations is quicker, and the trains are more punctual. And the better use of track capacity has let them add more train services overall, reducing crowding. Now, I loved the 8:06 and 8:17 express trains. But they were anomalies. Extra stops added to existing express trains a few years ago to relieve crowding at Ormond and Glenhuntly. Counter-intuitive because they left two minutes after other trains. I’m sorry, but such oddities are not the basis for a well-designed train timetable. 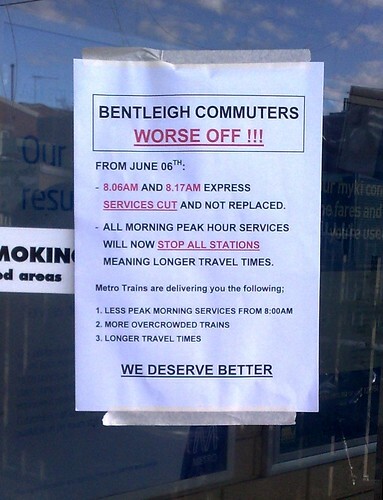 Those that have more right to complain are those from the end of the Frankston line and are losing their Express Loop services. It’s worth nothing that others who use Flinders Street (and probably more people will after the change) will get a quicker trip in on those expresses. So it’s not as if everybody loses out. But those who have to change trains will find it takes some getting used to. If you will now have to change trains and/or your trip takes longer, then of course you’re not going to be happy about it. The question will be whether these changes bring reduced delays that mean a more predictable, reliable, less crowded trip into work, even if it takes a few minutes extra than the timetabled theoretical travel time under the old regime. Metro and the government will be hoping this change results in that payoff. If not, people like Rob Hudson (state member for Bentleigh, a marginal seat) are going to be on shaky ground when the election comes in November. For those on the affected lines, how are you finding it today? And more significantly, once the dust settles in the next week or two, how is it? I’m a Sandy line commuter. No changes at all to our timetable. When I changed trains at Richmond this morning, two Metro-girls were handing out new Frankston and Dandy timetables. So full marks for publicity. PS Horrible incident at McKinnon station on Friday night. Why can’t CCTV footage be made clearer? I live at Craigieburn and it has its own railway line which opened 3 years ago. Meadow Heights station opened yesterday so I got a new timetable from the station when I took a sneak peak at the station yesterday afternoon. It was not relly crowded this morning. I downloaded a new timetable on my laptop and my dad uses the train to go to work and so I copied him a timetable. Upfield line, nothing ever changes here. 20 minutes if we’re lucky, ho hum. Mind you I had an appointment with someone for 9am and they were 25 minutes late (not sure which line they came in on), despite being on time all other times until this change. It’ll sort itself out, some win, some lose, but overall I can definitely see the merits of the standardisation that you described. Caught the 0818 from McKinnon this morning – much the same load as the 0816 it replaced. The train was getting very full by Armadale, and got to crush load at Richmond as the passengers bound for Parliament pushed on (probably from the express). The Frankston express that went through McKinnon while I was waiting had no standees at all, and may even had had empty seats. There was an ill passenger at South Yarra reported at about 7:20am, which would have thrown a spanner in the works for both Frankston and Dandenong. I caught the 8:07 from Bentleigh. The 7:58 had run a bit late (perhaps 8:01 or so), and the 8:07 had plenty of seats, in fact there were still seats available at Hawksburn. A short delay at Caulfield, but we got into Flagstaff about 2 mins late, so not too bad — in fact I was impressed that things had recovered from the delays earlier at South Yarra. Apparently at least one express direct train from Frankston that’s timetabled to continue to Southern Cross did not do so, which would have been annoying for those relying on it. At the time of writing, Metro’s web site is still linking to the old timetables, which I’m told they’re fixing now. So it sounds like a few hiccups on day 1.
the grumbler at the Age claims that train at 8:01 was the 8:03 running early. Can’t please anybody. Me again. I was on my bus on the way to school and I saw in the morning peak that there was only less than a quarter of cars in the station and that it was spotless. The money would have been spent on bringing rail services to Langwarra and Mornington. I mean at the new station at Meadow Heights. Hopefully the elevators don’t get graffiti or wrecked. I hear the Upfield issues mentioned – although it’s good to know that both buses and trains around the Pascoe Vale area seem to all cling to the 20 minutes or more rule. Bit like the 5 second food rule and about has healthy. One thing that does irk me though- why on earth do people still expect empty trains to magically appear at the precise time they want them to and drop them off so they can get to work just in the nick of time? It seems many people don’t wish to go that extra mile and get up a little earlier so they can avoid the squash and get a precious seat. heh. there were actually SIX people handing out timetables at Richmond station this morning – two for Metro and four Myki Mutes…the Metro-emblazoned two were doing their job while the MMs were just standing back, not offering anyone anything. The 4:54 Flagstaff to Frankston stopper filled up with (I assume) loop refugees from the express. Few of them seemed to change at Richmond or Caulfield to catch the express (the latter being a 2 minute wait, and no platform change), and some had trouble fitting on at South Yarra. The express passed us at Ormond, and appeared to have plenty of space, unlike up to last week when it went round the loop and would be regularly utterly packed. So the plan to move some of the load off the express may have worked, though perhaps too much. Will be interesting to see how it changes in coming weeks as people adjust. The Hurstbridge line was 20 minutes late around 6pm. i’m on the werribee line. we’ve been doing the switch at north melbourne for loop trains for some time now and i really don’t mind. i figure in plenty of other large cities around the world you have to switch lines to get to where you’re going. the frankston passengers will get used to it. as you can see, the express trains overtake the stoppers which go via altona. what this all means in practice is that if you miss the 5.02, it’s an 18 minute wait for the next train (no point getting on the 5.14 because it gets in after the 5.20 at werribee). if you miss the 5.20, it’s a 22 minute wait. i know it must be a tricky line to run, sharing it with williamstown and geelong trains, but i wish the spacing between werribee trains was better in peak hour. the irony is that we have a 10 minute service in off peak! it’s also a crowded line – it’s not uncommon for me not to get a seat until hoppers crossing (2nd last stop). same in the mornings – people who get on at hoppers aren’t guaranteed a seat. i understand there are more changes to the timetables later this year, including to the werribee line. do you know if this problem is likely to be addressed? “A few minutes extra” is simply untrue for passengers on the Frankston expresses wishing to reach Parliament. And there is a very large number of such people. Metro suggest changing at Flinders Street to avoid overcrowding and delaying trains at Richmond. In the peak it can take 5 minutes or more to clear platform 8 / 9 where the Frankston trains arrive, cross the streams of passengers coming off platforms 7 to 2 and reach platform 1. There can then be around a 5 minute wait for the next departure and a further 8 minutes or so to reach Parliament. The additional journey time is therefore around 20 minutes and with the inconvenience of a fussy change at a very busy station. That is not “a few minutes”. It turns a 55 minute journey from Frankston into a 75 minute one. That is slower than the all-stations trains by around 10 minutes. It is easy then to see that the all-stations trains suddenly become the quicker option and may become the trains of choice for some. Extending that logic those trains then become so overcrowded that more stops are required to cater for the loadings offered and Metro can attempt to justify the removal of all express workings on all of the grounds that more stops are needed, that traffic upon then has diminshed and that they are, to use their own words, “working towards a Metro-style timetable”. That may be ideal for trips of up to 20 or even 30 minutes. It is absolutely not acceptable for trips of 75 minutes on the likes of the Pakenham and Frankston lines. This is an extremely retrograde move and has angered a very large number of Frankston line users. It must be reversed at the earliest opportunity. @OilyShoes, yes, there are some big gaps, due to the way extra trains have been slotted in over the past decade. Though would you really let the 5:14 go in favour of the 5:20, knowing it’ll only save you 4 minutes at the Werribee end? Perhaps if the 5:14 has seats, it’s worth taking it. The Northern group lines are meant to be getting a new timetable later this year. Presumably they’ll get another in 2011 when the Laverton turnback is finished; that’s when you’ll see a bigger difference, with probably all peak Werribees running via the express route, and Altona trains originating at Laverton. @Kamal, if I were going to Parliament (and possibly to Melb Central), I would be ignoring Metro’s advice, and changing at Richmond. Even if the subway and other interchange tunnels are packed, you (theoretically) should have only 5-6 mins to wait for an ex-Frankston stopping loop train on the same platform. Harking back to @Andrew’s comment, I caught the same train today — it was 7 mins late at Bentleigh, and 14 late by Flagstaff. Not good, but not overcrowded. However, the train around that time has had crowding problems for 10+ years now, because it’s the last one serving Highett-Glenhuntly pretty-much guaranteed to arrive in the CBD by 9am, and there’s a 15 min gap until the next. If they kept up the new peak pattern for a bit longer, there’d be an 8:25 train (from Bentleigh) theoretically arriving Parliament at 8:51, helping spread the load on the 8:16. Keep the comments coming, all, this is useful stuff. As someone who has to cross the Murrumbeena level crossing to get to and from work, I can say that the traffic banked up on either side of the railway line has officially gone from terrible to absolutely insane. I sat there for almost 10 minutes yesterday. Whether or not the new situation is better for rail commuters I cannot say, but it’s made things worse for some of us motorists. Tonight’s trip home was a model journey. 5:03 Flagstaff to Carrum dead on time, plenty of seats. Not sure how or why it should be so good! Express which passed at Bentleigh/Patterson didn’t seem too crowded either. @Eurazian, perhaps this will prompt more calls for grade-separation, which is long overdue. I know it could be pretty bad when I lived in Murrumbeena, and it’s a long way to Warrigal Road to avoid it (and impossible for buses, of course). At least pedestrians can use the footbridge. At Richmond would there be any point in walking further to get a loop train from platform 8? The crowding on those trains is far less sever, especially the ones coming from Glen Waverley. Still a lesser inconvenience than going to FSS platform 1! @Somebody, I’d agree, just bearing in mind that sometimes the Richmond central subway gets very crowded. This morning’s trip for me was the 08:22 Glenhuntly to City, running 6 mins late (so was the previous one), quite crowded, and virtually at crush load by Hawksburn. And they really need to put more handholds in the Siemens trains; for instance the area by the driver’s cab has only 6 straps, not nearly enough. Wednesday PM. Caught the 1651 Flagstaff to Oakleigh train, which only serves a handful of stations. Unsurprisingly plenty of space. Changed at Caulfield; the Frankston stopper wasn’t crowded, and on time. Overtaken by the express, which also didn’t look excessively crowded. Thursday AM. 0831 Bentleigh to city more-or-less on time (despite consistently incorrect info from Smartbus PID and green button). Not crowded. Thursday PM. 1750 Flagstaff to Frankston train, pretty much on time, not too crowded. Friday AM. 1046 Bentleigh to city, 8 minutes late (can’t blame that on peak hour congestion! ), though not crowded. The stopping all stations off-peak will take some getting used to, but you can understand why they’ve done it given the Dandenong line carries twice the number of people as the Frankston line. Friday PM. 1748 Southern Cross to Frankston train, 6ish mins late, quite crowded as far as about Toorak, then okay. Overall I think it’s gone pretty smoothly, though no doubt people who are now needing to change trains won’t think so, and may still be finding their feet. Somehow the duration of the trip seems to have been forgotten…. maybe the trains are less crowded because (1) it’s exam time for tertiary students & (2) its back to driving for many, because it takes forever to get to the city. Some idiot has forgotten we dont live in a communist world, and are capable of consulting a timetable & selecting the most appropriate train and stopping pattern for our needs. Using the hip “metro” world best practice doesn’t apply on our long distant routes (eg Frankston line) , where trains can overtake each other.. we dont need pretty patterns on the timetable. With the length of journeys now experienced on the Frankston line, there would be mandatory requirements for toilets on the trains in Europe. See Daniel, when you understand something you can write a far more positive, helpful and informative article. Thank you, I really enjoyed this. Now please go and read a bit about bike sharing, perhaps at the bike sharing blog and have a look at how your bike share article compares with this one.